TalkFloor's Dave Foster had me recently talking social media marketing with him. The result was four interview segments on FloorRadio [hence my title "Four On The Floor"] which aired on September 21 through 25, 2009. 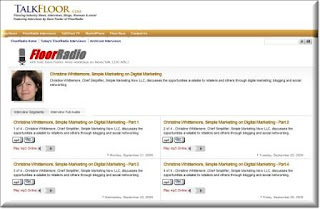 Christine Whittemore, Simple Marketing on Digital Marketing Christine Whittemore, Chief Simplifier, Simple Marketing Now LLC, discusses the opportunities available to retailers and others through digital marketing; blogging and social networking. Dave asks about Simple Marketing Now and integrating digital marketing with traditional marketing [e.g., the upcoming Surfaces Marketing In a Recession workshop]. With consumers increasingly starting their shopping at an Internet search window, you need to be found online, even/especially if you have a physical store. Your company website, digital tools like blogs and Facebook where you can publish your own relevant content and issuing press releases online help do that. Being found online, via your customer's search query, is critical. Especially if you have a physical store; if potential customers can't find information about you online, it's as if you didn't exist. Company websites are gradually transitioning from static brochures to dynamic sites with regularly updated content that helps tell your company story. Relevant content offers retailers opportunity for digital visibility. As with your physical store, your website should look inviting, neat, well organized, and freshly updated, too. Website content needs to be unique to you. It should reflect your story and experience and what is different about you. Definitely make sure the basics are covered. Include relevant information and how you connect with community. Add value with your content. I mention my friend, Alan Woody, and Carpets by Otto. Alan, the general manager, uses a blog for his website. He has found it an excellent solution that allows him to provide customers with the information they need on a timely basis. Dave asks about the demographics of those using social media tools. I believe embracing social is more of a mindset than a function of age. After all, search is growing in importance across all demographics and the tools of social media allow you to extend your reach and connect with customers. You do need to experiment to understand what's right for you and your customers. But, if you are serious about engaging with customers, tools like blogs, Facebook, Twitter can be fabulous ones for doing so. The cost for using these tools is minimal. However, there is a critical investment: involving your people and having them fully participate in customer conversations. As with any new program, there is a learning curve. The assumption, though, is that you are already committed to interacting with your customers. So these tools allow you to repurpose what you are already doing and get more use out of it, strengthen your customer relationships and develop a loyal community. What about content. Ideally, you should be creating content that has meaning for a visitor or potential customer. For example, a customer testimonial; articles about proper cleaning techniques... Getting started and being consistent in the effort matters. Social media marketing is not a campaign; it's an ongoing customer commitment for the long haul. It becomes part of how you do business. The magic of social media is that those who are attracted to your content are interested in what you have to say. This is a paradigm change. You are no longer trying to reach the masses because masses are massively not interested. Rather, you want to reach individuals who are interested. That means that they are pre-disposed to what you have to say and offer! Next, it's important to integrate the various marketing elements. A person who discovers your blog has a better reason to visit your website and is more qualified and closer to wanting to talk to you about product. I share examples of small businesses like WiseGrass and NakedPizza using social media to market themselves and how they integrate the elements. Dave asks about the relevance of social media for a product like flooring [this will be the subject of a separate post]. I see lots of opportunity for helping understand how to care for products. Most people don't know how! For example, I learned by videotaping Annette Smith that you must blot not rub a carpet to remove a stain. What a big deal for setting expectations on how to care for product and what an opportunity for having consumers come back to more information. How do you get people to visit your sites? Same as for your stores! You're now having to do more in the community -- as I describe in "retail outward" -- to interact with people and make them aware of your relevance to them. It's a matter of being aware of what happens that affects your customers and listening to them where they are talking and interacting. As Dave astutely observes, everything feeds into everything else! I mention the Conversation Prism visually capturing how integrated all of the elements are. How to get started? Pay attention to your own customer dynamics and marketplace. Spend time online to start listening [e.g., have you set up Google alerts? ], take little steps to start exploring, get ready to connect, and eventually strategize and integrate it all. 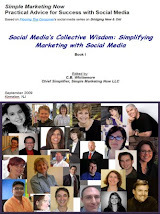 A good resource is my free e-book Social Media's Collective Wisdom: Simplifying Marketing With Social Media with 26 prominent social media practitioners offer recommendations on how to bridge new and old forms of media to better connect with customers. + Social Media 101 takes place Tuesday February 2, 2010 from noon to 1pm. With over 70% of consumers spending significant time online before buying, it's critical for retailers to connect with them digitally via social media marketing. And, the added benefit is that it's fun; there's so much to learn from engaging customers in conversation and figuring out how to offer value to your marketplace. What about you? If you've taken the social media plunge, what got you started? What frustration or opportunity did you see being able to tackle? Thank you, Dave, for this wonderful opportunity! Please, let me know if you have any questions. Thanks for reading and listening.